Put out to tender, the Australia Council’s Art in Festivals strategic initiative has been twice secured by Hobart’s Salamanca Arts Centre which created the SITUATE model. Melbourne-based freelance curator Kelli Alred started work as Executive Director of the second SITUATE in January this year. Her background is in commissioning new work with a focus on temporal and spatial practices in the UK for 12 years before returning to Australia. RealTime asked Alred to describe precisely how SITUATE operates and in what ways it has been successful. Alred says, “Situate facilitates an experience, a residential multidisciplinary Arts Lab, so that artists can create works that are bespoke to the festivals. So we have a focus on partner festivals specifically and part of the concept of the Arts Lab is to bring the curators and directors of those festivals together with the artists.” For 2015-16 the partner festivals are Dark MOFO, MONA FOMA (TAS), Darwin Festival, FRINGE WORLD (WA), WOMADelaide and Vryfees (South Africa). One artist has completed her commission, two are about to and a fourth is moving towards being commissioned. Cigdem Aydemir is a Sydney-based artist who delivered a project for Bloemfontein’s 2014 Vryfees Festival. “The work looked at the tradition of the monument in the context of Apartheid South Africa. There are statues of past presidents of South Africa spread across the University of the Free State. 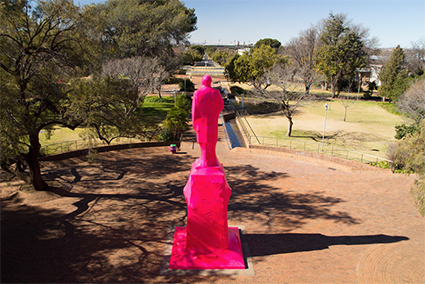 Cigdem wanted to, let’s say, ‘re-imagine’ and appropriate the notion of the monument in the socio-political context.” The work, titled Plastic Histories, comprises pink shrink-wrapped statues of presidents: the colour represents the women of post-Apartheid South Africa and the wrapping the plasticity of attitudes across generations. Artist Michaela Gleave recently attended her first WOMADelaide in March to see how the site worked when in full swing. Her project has progressed through the R&D phase towards commissioning. WOMADelaide, SITUATE and the artist are investigating financial contribution options for the making of the work.